Hyundai has come clean on the first SR-badged version of its popular Santa Fe seven-seat SUV, as driven by motoring.com.au in October 2014, and rated 73/100. Developed in Australia, the new Santa Fe range-topper is now officially on sale priced at $59,990 plus on-road costs -- $6750 more than the Highlander luxury flagship on which it's based – making it the most expensive Hyundai bar the $60,000-$82,000 Genesis sedan. Based on the updated 2015 Santa Fe released last October rather than the facelifted model revealed in Korea earlier this month and due on sale here in the fourth quarter of this year, the SR adds a range of cosmetic and chassis upgrades to the Highlander menu. 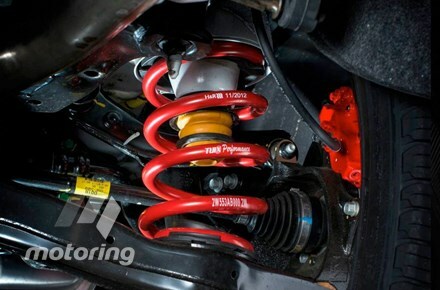 These include a full sports body kit, 19-inch OZ Racing alloy wheels with high-performance Michelin tyres, Brembo brakes and H&R Performance springs, as part of the latest local chassis tuning program undertaken by Hyundai Australia. In detail, Hyundai's fourth SR model (and first SR SUV) after the Veloster SR Turbo, i30 SR hatch and Accent SR hatch is differentiated from lesser Santa Fes by a sports front spoiler, side skirts, a racy rear diffuser with integrated exhaust outlet and matte-black OZ Racing Versilia alloy wheels measuring 19x8.0-inch (the same as the Highlander's standard wheels) and shod with 235/55 R19 Michelin Latitude Tour tyres. A full-size spare is standard. 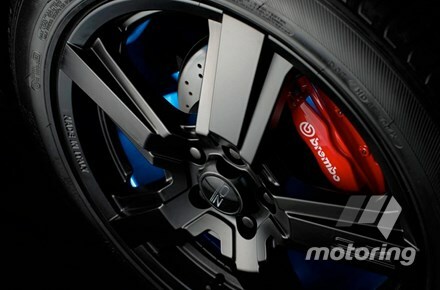 Braking is upgraded too, via red four-piston fixed monobloc Brembo callipers at all four corners, gripping 340x28mm front discs and 302x22mm rear discs. Hyundai says stopping distance from 60km/h is reduced by eight per cent compared with the regular MY15 Santa Fe. The Santa Fe SR is based on the Santa Fe Sports Package formulated by Hyundai Motor Corporation’s Customising Team in South Korea, but the company's new Aussie SUV flagship underwent a significant local development program led by Hyundai Motor Company Australia’s General Manager Product Engineering, Mr Hee Loong ‘Wongy’ Wong. The result was six per cent stiffer front and 11 per cent stiffer rear H&R Performance springs, while the Mando dampers, Flex Steer electric steering and Active On-Demand 4WD system with torque-vectoring Advanced Traction Cornering Control (ATCC) carry over from other Australian-specification MY15 Santa Fe models. “For us, it wasn’t about the wheels being bigger and wider, or having a different offset, but about spoke design and the required calliper clearance,” said Hyundai Motor Company Australia’s Senior Manager Product Planning, Andrew Tuitahi. The 145kW/436Nm 2.2-litre CRDi four-cylinder turbo-diesel and six-speed automatic transmission carries over from other Santa Fe models, as does a full safety suite including seven airbags, a reversing camera, ESC, TCS, ABS, EBD, BAS, HAC, DBC, LDW and a five-star ANCAP crash rating. The SR also comes with all of the top-shelf Santa Fe Highlander's standard equipment, which Hyundai claims is class-leading, including 12-way power driver’s seat adjustment, heated and ventilated front seats, heated second-row seats, rear-door sunshades, a twin-panel auto-closing panoramic glass roof, automatic xenon headlights, LED daytime running lights, 10-speaker premium audio system with Bluetooth iPod connectivity and a 7.0-inch touch-screen satellite-navigation system with SUNA traffic updates and three years’ HERE MapCare. There's also a powered tailgate with hands-free opening, proximity smart key with push-button start, dual-zone climate-control with vents for all three rows, rain-sensing wipers, front/rear rear parking sensors and underfloor rear cargo storage. Hyundai's most expensive SR misses out on the Santa Fe Highlander's automated parking system and is available in just four exterior paint colours: Creamy White (solid), and the metallic Sleek Silver, Titanium Silver and Phantom Black, each matched with leather-appointed black interior trim. Like all new vehicles from the Korean car-maker, the Santa Fe SR comes with a five-year/unlimited km warranty, lifetime capped-price servicing and 10 years of roadside assistance.